Aug. 22, 2017 - A new report available from reThink Wood demonstrates the fire resistance rating of glulam beam to column connections in Type IV construction. The findings support mass timber as a safe solution that meets, and in some cases exceeds, stringent fire safety standards for U.S. building design and construction. 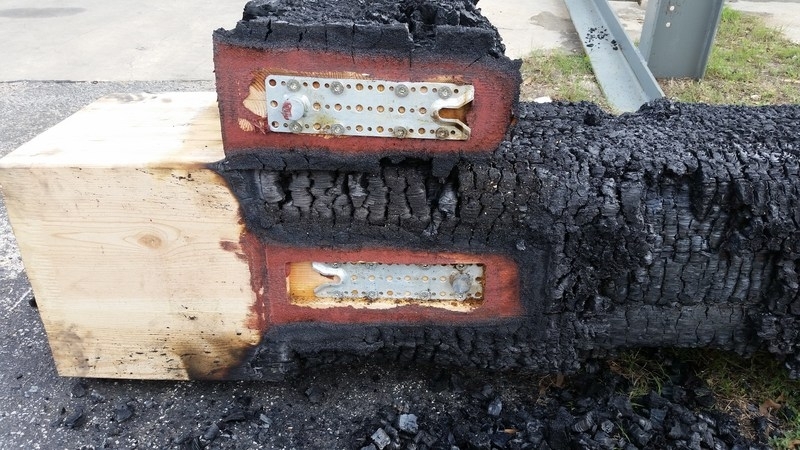 All connectors passed and achieved at least a one-hour fire resistance rating (FRR), allowing them to be used in buildings up to 85-feet in height. The three different configurations of glulam beam to column connections were fire tested at a U.S. nonprofit, independent research and development organization with approved fire testing facility. The tests were carried out to meet ASTM E119-16a “Standard Test Methods for Fire Tests of Building Construction and Materials,” and satisfy requirements of Chapter 7 of the IBC. The full summary report is available for free download at www.reThinkWood.com. Additional mass timber and wood building resources are also available at reThinkWood.com and the reThink Wood Research Library. The preeminent provider of interdisciplinary engineering, consulting and design services, Arup drives the world’s most prominent projects, from city-building to iconic architecture. The firm opened its first U.S. office over 30 years ago and now employs 1,300 people in the Americas. Since its founding in 1946, Arup has pioneered groundbreaking strategies, technical excellence and social purpose. As a responsive and respectful business partner, Arup honorably serves its clients and shapes a better world. Learn more at www.arup.com. The Softwood Lumber Board (SLB) is an industry funded initiative established to promote the benefits and uses of softwood lumber products in outdoor, residential and non-residential construction. Programs and initiatives supported by the SLB focus on increasing the demand for appearance and softwood lumber products in the United States. Learn more at www.softwoodlumberboard.org. reThink Wood represents North America’s softwood lumber industry. We share a passion for wood and the forests it comes from. Our goal is to generate awareness and understanding of wood’s advantages in the built environment. Join the reThink Wood community to make a difference for the future. Be part of the conversation to “rethink” wood use, address misperceptions and enhance awareness of wood’s benefits and choices. Learn more at www.reThinkWood.com.